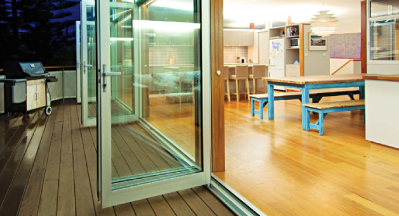 This high performance bi-fold door is ideal for use in residential applications. Panel heights of up to 2.6m and a wide range of folding configurations means this system can be used to achieve clean wide openings. Series 548 Bi-fold doors can be fitted with Centor™ retractable screens for the ultimate screening solution. Inspired by European systems the Series 548 is bottom rolling ensuring heavy panels (e.g. with double-glazing) can operate easily. Doors run smoothly because all the weight is carried on bottom rollers. Supporting panels at the base eliminates risk of lintel sag. If the lintel sags the panels would bind. Narrow transom profile allows a designers to include 2100mm high doors plus an overlight in a standard 2400mm high opening. (Opening sashes as well as fixed over lights are available). Series 546 Bi-fold windows are available to match this system. Wide top and bottom rails give the door the bold appearance of traditional timber designs. Series 548 doors incorporate specially designed compression blocks and backing plates at the four corner joints of the door. These take the “sloppiness” out of corner joints and make sure that the door stays rigid and square. The centre hinge between door panels has a built-in handle to allow panels to be easily pulled back into the closed position. Bi-fold panels can be fitted with ClearVENT™ sashless double-hung panels. 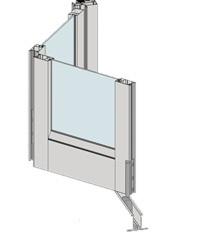 We offer a large range of snap on couplers that allow us to join bi-fold doors to any Vantage window. Bottom running bi-fold gear allows us to fit highlights over on very tall frames. These highlights could be fixed glazing or opening windows.